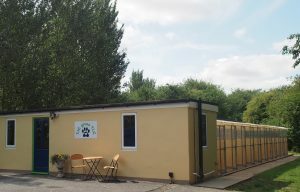 Tejaycey boarding kennels and catteries which has been in Wisbech, Cambridgeshire since the 1960’s is under New Ownership: Judy and Avi Goldfarb. My husband and I feel incredibly lucky to have acquired this fantastic business with all the wonderful canine and feline clients we are looking forward to meeting. We are thrilled and excited with this opportunity to continue and to improve on the service you all deserve. We love the kennels and the site with the magical orchard attached for walking the residents. More importantly we are an older couple who have put aside the need for living in the “rat race” and are looking forward to be able to devote daily care and energy on all the animals using the kennels and cattery. This is a dream come true for both of us and we will make sure the care and attention given to your family members is second to none. Tejaycey is a wonderful retreat situated in Wisbech surrounded by orchards and fields on 3 sides with peacocks and chickens as our next door neighbour. The acre of land is well spaced so that all kennels look out over the countryside. The indoor areas are large with plenty of space for the largest of dogs and we have double and family kennels to accommodate all guests in the style they require. Each kennel has a very large external run all facing green vistas. We also have full grooming services. Tejaycey has exclusive access to 8 acres of orchards for the use of the dogs so we are only too happy to let them walk and explore (on the lead, of course). Tejaycey’s catteries are no less special than the kennels and are separated from it by large areas of lawns, bushes and outbuildings. The felines cannot see the canines and vice versa. Each beloved pet can sit and look out at the green views, resting and contemplating in quiet seclusion. When they are tired each cat can go up to their second floor, which is closed in with their heated bed, and sleep the day away as they love to do. In the cattery we can also accommodate 2, 3 and even 4 family members together. The whole site attracts birds and local wildlife and it is a special day when the peacocks come to visit. Please feel free to come and visit and we look forward to when you will come to stay.